You've seen me talk about it. You've seen me demonstrate it. And you've asked me when you should buy it. The Canon iP8720 Crafting Printer is my printer of choice for everything from 4x6" photos up to my most favorite 13x19" size print outs. 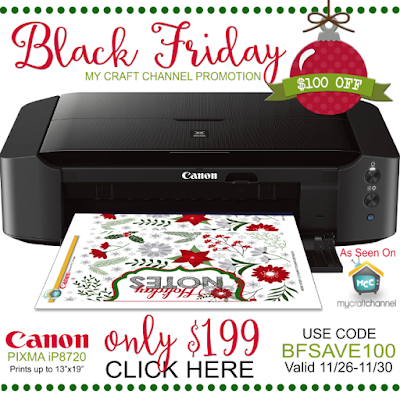 I have shown you a ton of projects here on my blog as well as on Get Creative with Canon on My Craft Channel and now it's time for a deal you won't want to miss!! Join me for Inspired by Pinterest at My Craft Channel as I share the many ideas you can create using candy canes and peppermint candies that so plentiful this time of year. 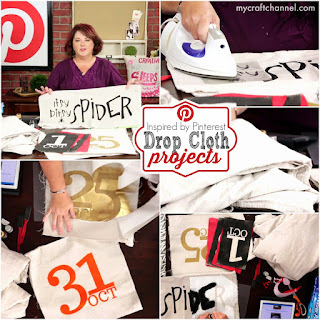 I don't have pins to share with this episode since it's based of two previous DROP CLOTH episodes that aired last year. You can check them out below...they link back to the original post AND video. If you know Bear Lake, October is typically not a good time of year to hang out up there. Some years it has been super cold and even snowed on us one year. But this year the weather was so warm and lovely. We decided to have our friend Kate from Art Affair to teach us how to paint a beautiful boat on the shore painting. We customized our paintings to look like Bear Lake and the gorgeous view we saw. I actually got a bit sunburned on one side, but painting outside was worth it.